Website design for Robert Markovac, a Melbourne based personal trainer. Fitness is one of the rising demands of today’s generation, all slaving to a deskbound life. 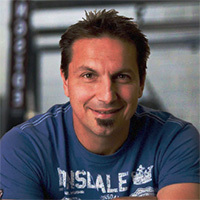 Robert Markovac has over 18 years of experience as a Personal Trainer. He feels lucky enough to work in an industry that he is simply obsessed wit, as this career choice allows him to fulfill his passion and the undying craze for health and fitness. Being a fitness freak, he actually loves his profession because of the rewarding feeling he gets with the magical body transformation of a grateful client and the new lease of life a client gets after seeing the pounds peel off! He has served as a fitness aficionado and trained and patronized hundreds of people, whether they are new mums flabbergasted at the pile of pregnancy weight or desk job personnel having no fixed time to focus at fitness, each one from various walks of life, having entirely different physiques! Sounds swell, isn’t it? Well, Robert helped many fitness seekers and made each one reach out for the stars, actually by getting the svelte, Hollywood figure they loved so badly! Whether the weight target was big or small, he helped his clients improve core strength and mentored weight loss quite scientifically, keeping in mind not to let the drive and the energy levels of his client droop low! A new website that would enlighten people to seek his fitness fulfilling powers and help them lose the unsightly weight in no time! Robert got a completely revamped website, almost as good as new! The biggest challenge that he faced, was, that he had a lot of highly specific training options for almost everyone, literally! Men and woman, young or old, it didn’t matter a bit. So, all we needed was to do something that befitted unisexually for either gender and encourage them to take the first few steps towards getting a fitter, healthier life! Always wanted to wear the tiny black dress tucked in the dark corner of tour wardrobe? Well, ask Robert to help you wear it sleekly! The buttery yellow slogan, depicting boldness, strength and vigor, triggered a powerful image to woo the fitness followers and the weight watchers! He targeted every client and identified their own set of health issues precisely! One can always choose the most likeable option amongst the various training options and book a free training session with a few bolting clicks and there you are, ready to baffle and dazzle!